A sweet, deeply personal portrayal of female adolescence that’s more attuned to the bonds between girlfriends than casual flings with boys, writer-director Greta Gerwig’s beautiful Lady Bird flutters with the attractively loose rhythms of youth. Anchored by an expressive mother-daughter story in which unconditional love and enmity often seem one and the same, and elevated by an entrancing Saoirse Ronan (easily among the best and most intimate actors of her generation), Gerwig’s accomplished directorial debut makes you wish she’d spend more time behind the camera. With her keen ear for female familiarity (she co-wrote Frances Ha and Mistress America), Gerwig sets Lady Bird during that exhilarating, confusing period known as high school senior year, when childhood-defining friendships start slipping away, hormones begin calling the shots and a better existence seems to await elsewhere. We follow the rebellious, opinionated Christine &apos;Lady Bird&apos; McPherson (Ronan, vanishing inside her funky, disorderly character) as she completes her final year of Catholic school in 2002. This is right after 9/11, during the Iraq War (often referenced in the background) and before cell phones got smart, further complicating teenagers’ lives. Lady Bird spends her days quarreling with her equally strong-willed mother, Marion (Laurie Metcalf, invincible), slacking off with her good-natured best friend, Julie (a pitch-perfect Beanie Feldstein), and dreaming of a liberal East Coast college, away from her sleepy hometown of Sacramento (the 'Midwest of California,' as she puts it). 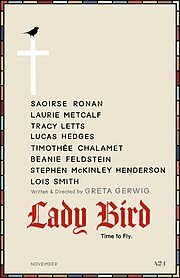 But Lady Bird’s plans prove to be at odds with her middle-class family’s financial struggles, compassionately represented throughout, especially after her father, Larry (a low-key, gentle Tracy Letts), loses his job. Joining the ranks of The Diary of a Teenage Girl and The Edge of Seventeen as a refreshing woman-centered coming-of-age film (and offering more depth than either), Lady Bird captures a recent era with precision and a hint of nostalgia that’s not distracting: clunky flip phones and 'Cry Me a River' blend right in. Thoughtful and generous, it’s that rare ensemble film that gives its side characters enough room to breathe and grow: Two romantic interests – played by Lucas Hedges and Timothée Chalamet, both superb –as well as an upbeat nun (the legendary Lois Smith) stand out in this loving ode to mothers, daughters and the girlhood towns we never fully leave behind.